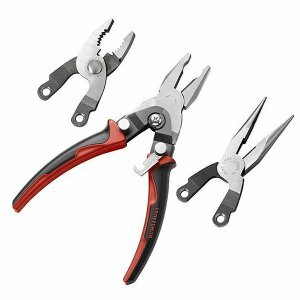 Three plier heads with one quick change handle create an unbeatable plier combination. Featured are 8-IN Combination Slip Joint Plier head, 8-IN Long Nose Plier head and 7-IN long Linesman Plier which is easily interchangeable onto a compound action plier handle. Completing the 3-IN-1 Pliers set is a carry storage pouch, keeping all the plier heads together.